List of best alternative keyboard apps for iOS and Android mobile phones. These apps are better than default keyboards with features like swipe & glide typing, hundreds of smileys, word prediction and auto-correction. Although the default iOS keyboard is feature packed, sometimes the default keyboard may not appeal you. People out there who are disappointed with their default keyboard apps can download alternative keyboard apps that meet their requirement. Some of these apps are free while you need to purchase the others. Most of these mobile keyboard apps are bundled with fun themes, interesting new features, and support for other languages. Typing on mobile keyboard is very different from typing on computer. Different people have their own styles of typing on mobile phone — therefore any one keyboard app can not cater to everyone’s needs. You should explore alternative mobile keyboard apps to see if any one of these makes your typing experience better. This article lists out some of the most popular keyboard apps for Android and iOS. SwiftKey keyboard for iOS and Android is a free smart keyboard app that efficiently replaces iPhone’s built-in keyboard. It is loaded with features that make typing easier, including multilingual typing, supports hundreds of Emoji and speedy swipe typing. It allows you to type more accurately, in your own style of typing and in a language of your choice. SwiftKey supports over 20 languages including four versions of English for iOS. For Android it supports over 100 languages. The app also allows you to customize your message apps with colorful themes. SwiftKey’s standout features are word prediction and auto-correction. With Fleksy, you can enjoy typing in an interactive manner and in your own style. 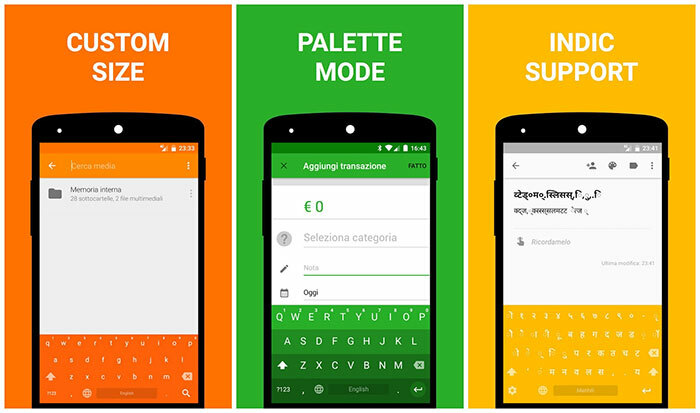 You can customize your keyboard with powerful extensions and more than 35 colorful themes. Some of the themes cost $1, but most are free. It includes about 800 Emojis and has its own built-in GIF search engine. This keyboard supports 40 languages including English, French, Spanish, Dutch, and more. It learns your typing habits and proceeds to give you accurate predictions, which helps reduce typos. Other features include swiping and gesture support. Fleksy supports iOS and Android. Gboard is the keyboard from Google for your iPhone. This keyboard is simple and includes almost everything like sending GIFs, Emojis, Google search, sending directions, and more. With Gboard, you can search and send anything from Google, including information on nearby restaurants, videos, images, weather forecasts, news, sports scores, and more. The app also adds Glide Typing, which allows you to type messages faster and more accurately. It also supports voice typing on the Android version and, of course, both versions are free. Swype is incredibly intuitive. It can pretty accurately predict what you wish to type or swipe. The keyboard has an extensive Emoji collection, seamless regional dialect support, and includes five free themes. If required you can purchase more themes. Swype gestures allow you to enter symbols, punctuation and upper case letters, which makes texting quick and effortless. You can add or remove words from your personal dictionary to avoid auto-correction. You can also find customizable keyboard layouts and much more. You can purchase the iOS or Android version. Go Keyboard provides the next word prediction, swipe typing, emojis, and stickers. You can customize this keyboard with themes, custom backgrounds, key tones and fonts. It supports an impressive number of languages and the free version alone supports more than 40 languages. The paid Pro version supports additional 60 languages. 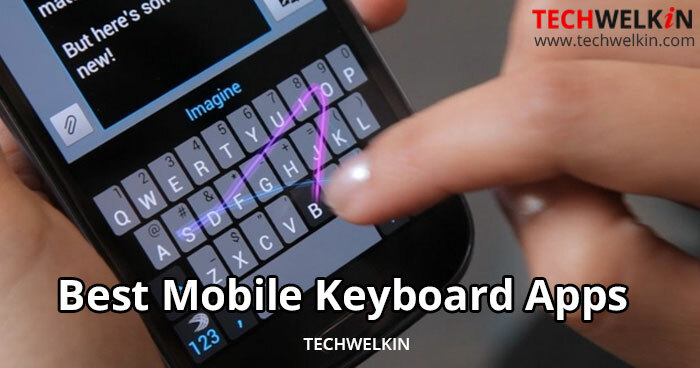 It also supports gesture typing, voice input, GIF and QWERTY, QWERTZ, and AZERTY layouts. You can purchase the Android and iOS versions. TouchPal includes all the regular features that one could expect from a good mobile keyboard. You can access hundreds of emojis and take advantage of swipe gestures called TouchPal Curve. What sets this keyboard apart is the number of available new themes and more than 100 new text art options for your key fonts. You can download the free iOS or Android version. Minuum keyboard app comes with a standard looking keyboard that is lightly configurable. Do not forget to try the keyboard’s mini-mode feature. Minuum is ideal for typing comfortably on smaller devices. You can use the powerful auto-correct tool, multiple word predictions, or turn off auto-correct if required. It also supports smart emojis, over 10 languages, a number of good themes, keyboard shortcuts, dictionary control, and much more. There is a learning curve involved but soon you will get the hang of using the keyboard. You can try the 30-day free demo for iOS or Android before purchasing it. Multiling O Keyboard as the name suggests, supports over 200 languages. It also includes gesture typing, the ability to set up a PC-style keyboard layout, keyboard resizing and repositioning, themes, emojis, various layouts, and the all-important — the number row. It is supported on Android and entirely free to use. Chrooma keyboard is a relatively new entrant but it includes all the desirable features in a mobile keyboard. It includes with swipe typing, keyboard resizing, and night mode. You can also change the color of the keyboard to suit your theme or tastes. It includes a number row, emoji, and support for 60 languages. It is customizable, simple and supported on Android. You can purchase it from the Play Store. Word Flow Keyboard is free to use and supported on iOS and Android. It is an ideal keyboard app for large phone users. It allows you to access your photos, contacts, and GIFs. With one tap, the keyboard displays as an arc, and you can easily swipe or type with just your thumb, and still be able to reach all the alphabets. This keyboard is only available in English for users in the U.S., or users with a U.S. iTunes account. These were some of the best alternative mobile keyboard apps that are nowadays available for Android and iOS. Try them and let us know you experience. Also inform us if you want to add another great keyboard app to this list.